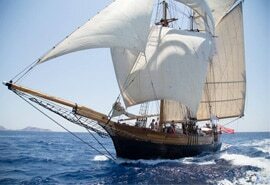 We offer a variety of sailing holidays, from tall-ship sailing experiences to expedition yacht charters and wildlife watching. All whilst exploring stunning locations around the world! From our office in Cornwall, we manage every level of your booking – and (crucially) make sure it is passed on to the skipper and crew of your chosen ship. With a whole lot of experience in the holiday, sailing and marketing industry, we make sure no detail gets left behind – from comprehensive joining information to making sure any dietary needs are taken care of. As a small team, we are able to form real relationships with our skippers, making sure our (and their!) customers have the best possible experience. Any boats that join up with VentureSail are researched by us thoroughly to make sure that what they offer is of the highest quality, with the most beautiful boats and adventurous destinations. 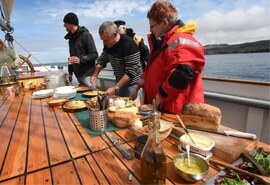 The most important thing, however, for both guests and skippers, is that we are here on dry land. So we can field bookings, queries and questions as quickly and efficiently as possible. Book with VentureSail, and we will offer you friendly, helpful advice, organised, straightforward booking and useful joining instructions before handing you over to your chosen Skipper who will then endeavour to give you the experience of a lifetime. If you're travelling solo, then join one of our ventures and leave with new friends. 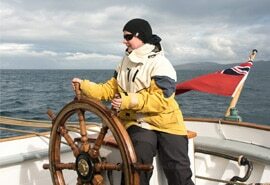 Get hands on sailing experience or kick back and relax, the choice is yours. Enjoy freshly prepared meals during your venture using locally sourced produce. Before you embark on your venture, you will need the correct insurance in place.